Today's Inspiration: Pete Hawley: No doubt, the envy of his peers! Pete Hawley: No doubt, the envy of his peers! 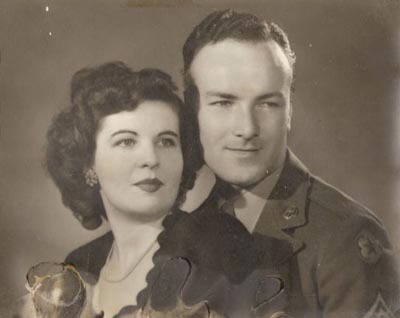 Pete Hawley and his beautiful young bride, Mary Jane "Micky" Hawley, probably c. 1945, in a cherished photo courtesy of their granddaughter, Shelley. Shelley says, "They were two very different people. Different religious backgrounds, different political views... but they made it work - and they were a lovely couple." When Pete Hawley was discharged from the army he must have felt he was ready for "the big time". Despite his pre-WWII success in Chicago he chose instead to move to New York. There he shared a studio with two friends who had served with him at Fort Mead - Sherwood Finley and Irving Werbin. Werbin was a lettering artist who would later become a partner in an ad agency called Irving & Morell. Finley did fashion illustrations "of men in Brooks Brothers suits," says Shelley. "They worked together for years." 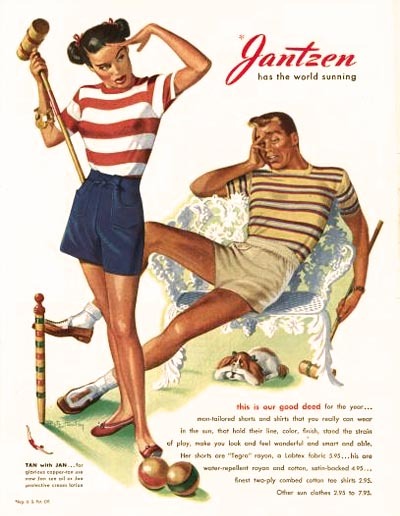 Around 1943, Pete Hawley had begun illustrating ads for Jantzen clothing. One has to wonder how this account came to be his... was it the result of his friendship with the fashion artist, Finley? If both men were working together in the Fort Mead art department and Finley already had established contacts in the fashion industry, its possible that he had passed the client along to Hawley, whose earlier work doesn't show any inclination toward fashion illustration. Whatever the case may be, the Jantzen account would prove to be one of the most fortuitous business relationships an illustrator could ever hope for. 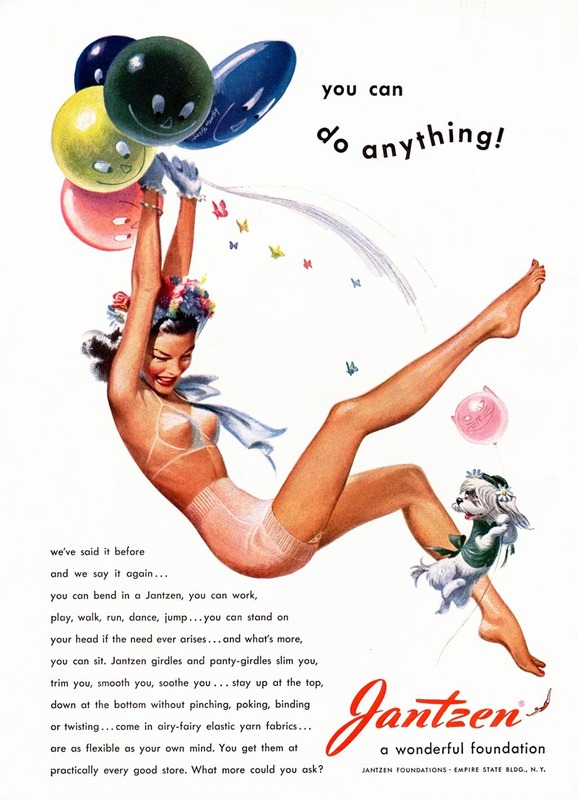 Over the next decade-plus Pete Hawley illustrated countless ads for the various divisions of the Jantzen clothing company. On these ads his style truly began to mature. Initially, in the early 40's, it was quite "straight" and literal. Gradually it became more playful and stylized. 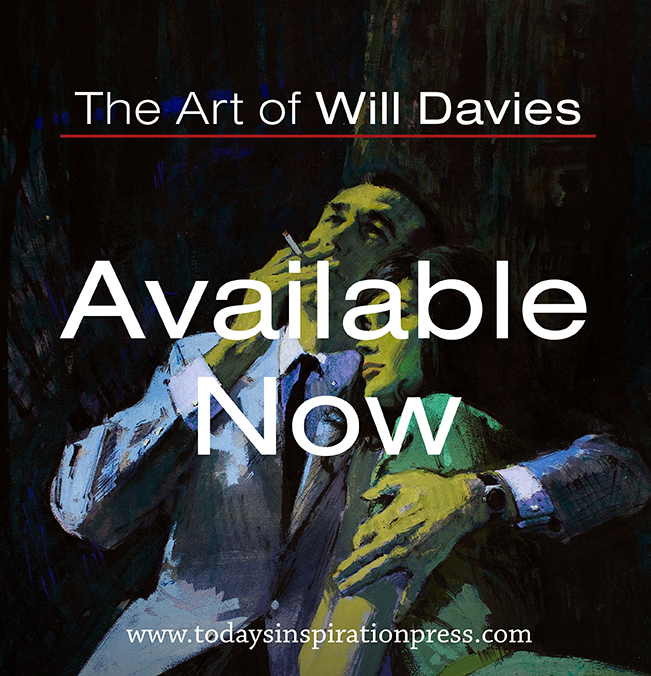 You can see in these ads from around 1950 that Hawley had become extremely confident and comfortable in his ability to portray a sort of innocent sexuality that was perfectly suited to the subject matter. Having the steady income of a lucrative advertising account and the opportunity to paint gorgeous girls in their underwear must have made Pete Hawley the envy of many of his peers! 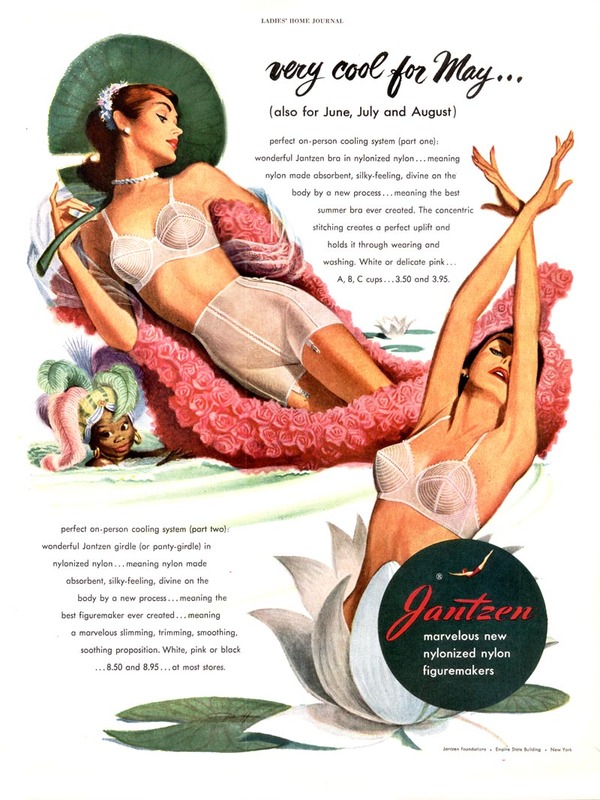 One can fairly say that by the early 50's Pete Hawley had established the signature "look" for Jantzen's foundation garment ads. 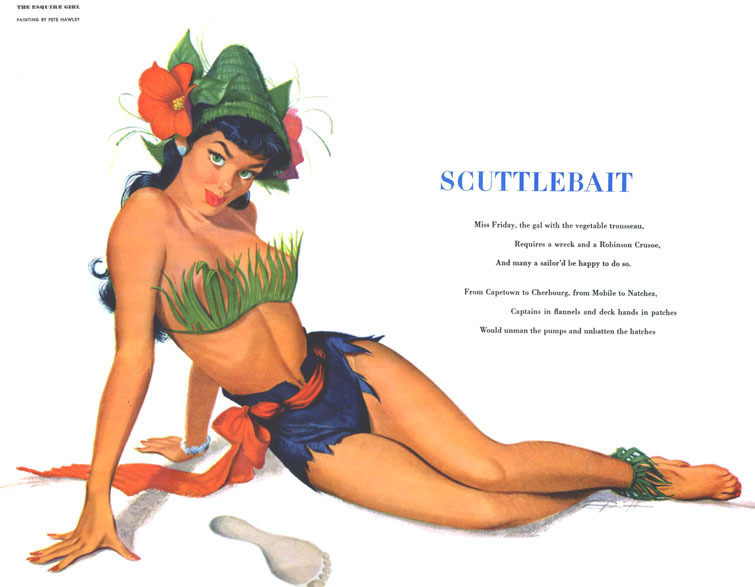 That fresh, appealing style might have caught the attention of Esquire magazine's AD, because Hawley did two Esquire Girl pinups in the early 50's. As far as I know, this was his only foray into pinup art. 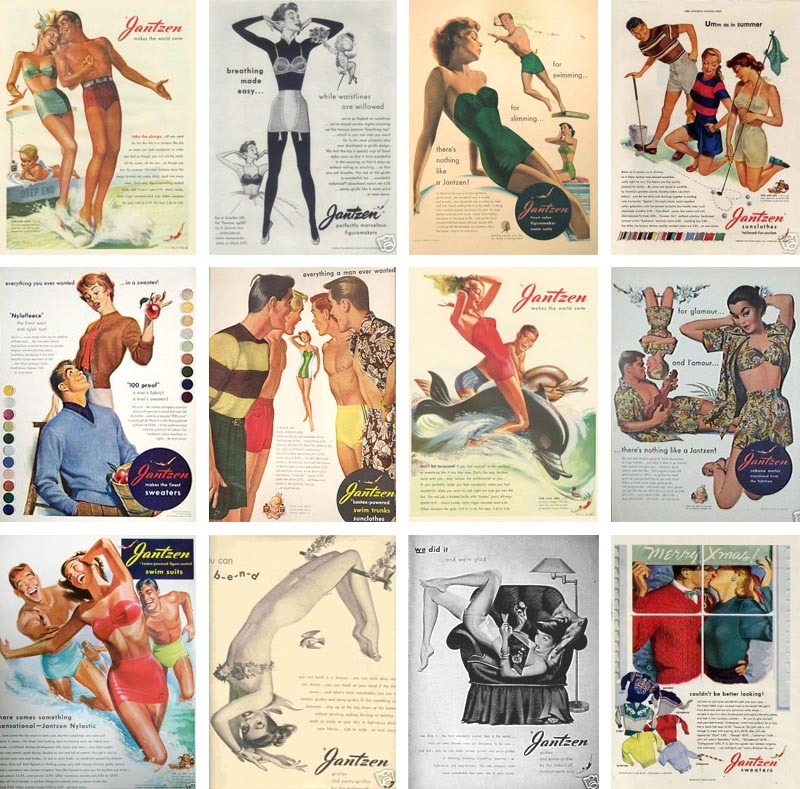 Juxtaposing Pete Hawley's Jantzen lingerie and swimwear ads against his Esquire illustrations raises an interesting question: was he a pinup artist doing fashion illustrations or a fashion illustrator with a knack for pinup? Whatever the case, just imagine how much Pete Hawley must have enjoyed getting up to go to work every day! 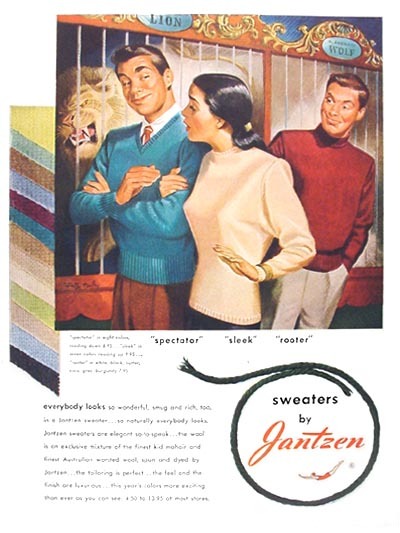 When I asked Shelley about her grandpa's Jantzen ads she wrote back, "I do know that he had models in their underpants at his house in the studio. LOL!" "I know that my grandma was a great sport." * Many thanks to Shelley Nugent for all her invaluable assistance with this week's series on her grandpa, Pete Hawley. * Thanks as well to Shane Glines of Cartoon Retro for generously allowing me to use his Pete Hawley Esquire Girl scan. * My Pete Hawley Flickr set. Hubba hubba. I hope I spelled that right. 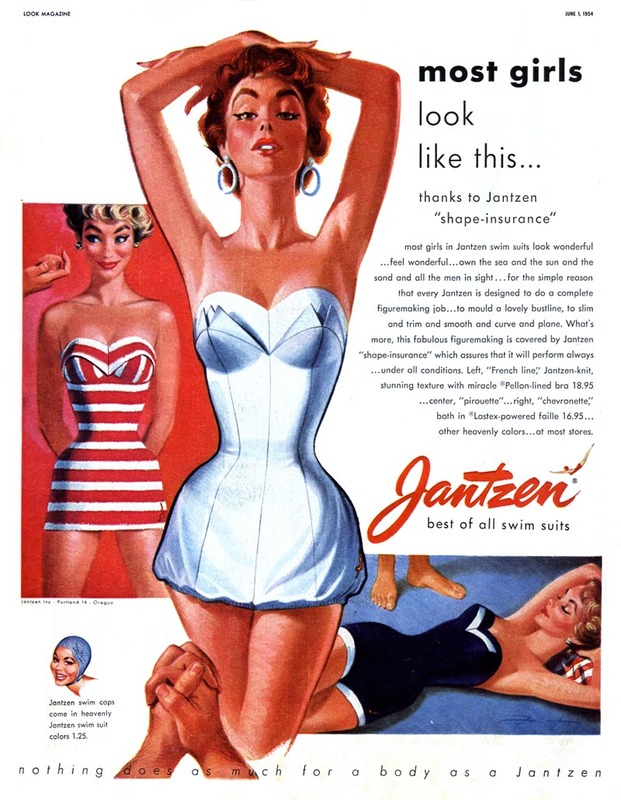 Thanks for this Leif, I've always wondered who was the artist behind these Jantzen ads.He really was a top figure artist and I love that uncontrived air of innocent sexuality that ran thru the campaign. I'd be interested in knowing what were those political and religious differences between the Hawleys, Leif. Any info? Beautiful use of white space along with the beautiful ladies. Anyone notice the guy in the second ad doesn't appear to be looking at the gal? Great stuff as always Leif! Hawley is easilly among my top ten favorite American illustrators. He just had "it". The oomph to his eyes and smiles are indescribable. I also can't describe the giddiness I experienced when I saw these new Hawley's you shared with us Leif. Thanks a zillion. Hi Les. I am a member of the Hawley family, we have many card copies, sketches, etc. Please let me know how I may share some images of them with you. We are also trying to sell some of the items individually or as a lot, if you know if anyone interested please do send them my way. Thank you for the lovely comment, love to see him so loved still. Hi, all . . Sherwood Finley was my dad, and Pete was like a second father. Miss them both all the time. Pete wrote the greatest letters, illustrated, of course, and delightful. We kids were often roped into posing for the ads. Another illustrator of note from that period, Victor B. Kalin, was my uncle. He did lots of book covers and LP covers. Miss them all. They were very sweet guys. Pete Hawley was my grandfather and love to see his art still living....I noticed today several of his works are in Mad Men, amazing to see him still shining.